The last time we heard from veteran local chef Sebastian Ng was back in 2014, when he announced that he was leaving Restaurant Ember, the eatery he had helped co-found 12 years ago. Known for its Asian-inflected, modern European cuisine, the restaurant was a household name in the local dining scene during its heyday. After stepping down from his role as head chef at Restaurant Ember, Ng went on a three-year hiatus to spend time with his family, and go travelling in search of culinary inspiration. 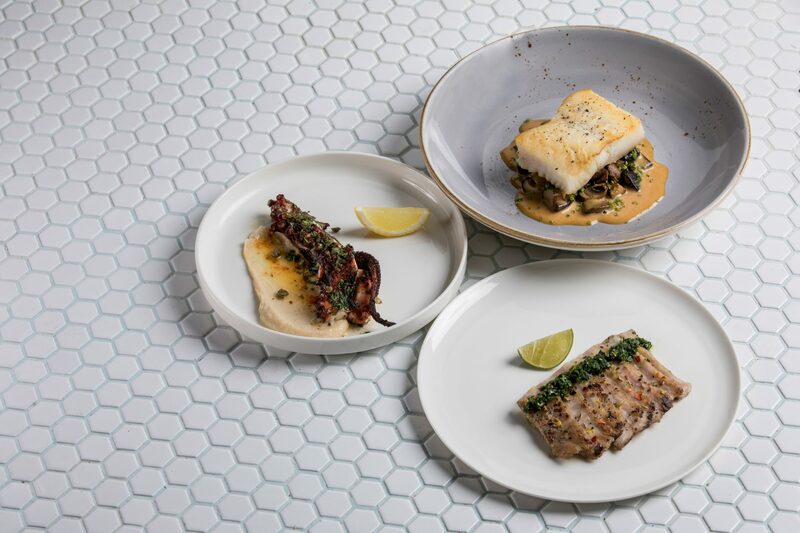 Now, he’s back with a new restaurant: Venue by Sebastian, a casual joint serving up — naturally — modern European nosh that includes some of his signature dishes from his Restaurant Ember days. Venue by Sebastian is located at Downtown Gallery, a new shopping centre that’s part of the upcoming OUE Downtown mixed development. With most of the mall still under construction, finding the restaurant may prove to be slightly challenging. Pro-tip: If you’re coming by car, alight at the taxi stand right outside the building’s Tower 2, and turn left to walk to Tower 1. You’ll pass several boarded up doors and “no entry” signs before reaching the entrance. Stroll past more boarded up shopfronts, and an Express by Chatterbox (which is only open on weekdays till 6pm), and you’ll spot Venue by Sebastian on the right. The restaurant spans 1,900 square feet and is fitted with an open kitchen, where diners can catch the chefs in action. Furnished in soothing white and grey hues, with exposed lightbulbs and sturdy wooden chairs, the 80-seater place carries a relaxed, informal vibe. For a dash of whimsy, honeycomb-like tiles adorn its walls. Even the food ordering process is a casual affair here. Diners are presented with menu sheets, where they can simply tick the items they want. The dishes are categorised into different categories such as “Toast” (for bread-based offerings, naturally), “Pasta” and “Pan, Coal & Roast” (grilled meats and seafood). A closer look at the restaurant’s interiors. 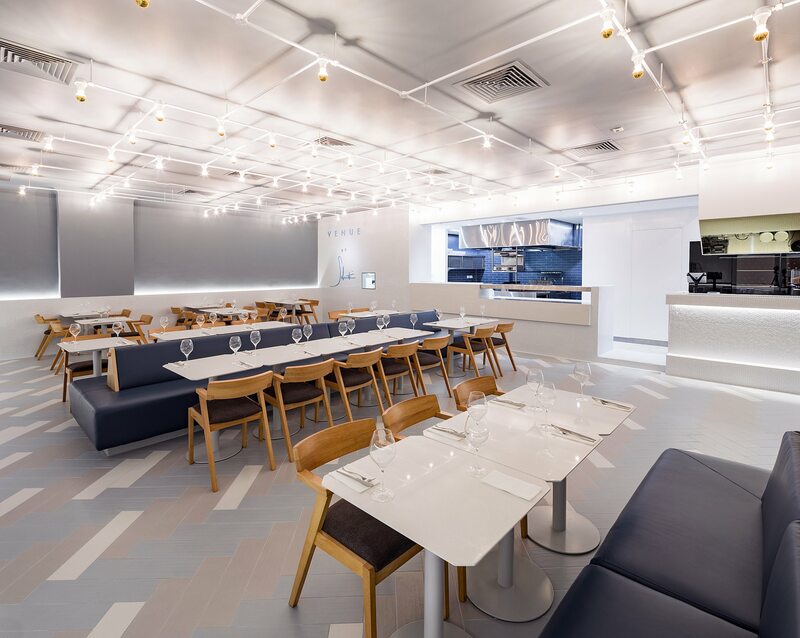 The restaurant focuses on modern European cuisine, and its kitchen is led by chef-owner Ng and Chef de Cuisine Jonathan Lee, who was formerly the head chef at Middle Eastern eatery Artichoke. Its food, which is an eclectic mix that ranges from tofu salad to hot-smoked salmon and grilled US rib eye, is served on sharing plates. There is no distinction between starters or mains here — the dishes arrive in random order, so one never really knows what to expect next. When we visited the place for dinner, our first dish to arrive was the chilled Romanesco with lemon vinaigrette (S$12). The eye-catching vegetable, which looks like a cross between broccoli and cauliflower, made for a simple but refreshing start to our meal with its crunchy texture and tangy flavour. It was studded with almonds and slivers of parmigiano reggiano for a savoury kick. The Romanesco was followed by a bowl of crispy whitebait (S$9), which were lightly battered, moreish strips of joy coated in spicy chilli salt. And in case you’re wondering, no, the dish wasn’t labelled as fish and chips. 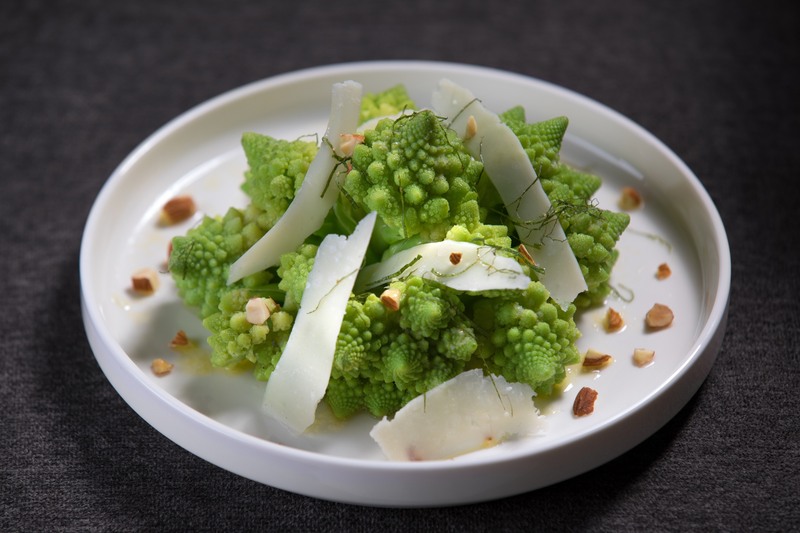 Romanesco is livened up with a dash of tanginess from lemon vinaigrette, and embellished with parmigiano reggiano. Another winner was the lamb riblets (S$5 per skewer) — small, tender and salty chunks of lamb seasoned with chimichurri rojo (an Argentine sauce comprising cayenne, bell peppers, paprika, vinegar and olive oil) and presented on a satay stick. The lamb was marinated to perfection, with barely any trace of gaminess. Our only gripe about this dish was its petite portion — we could have easily scarfed down a few more skewers’ worth of it. The star item of the evening was undoubtedly the cold pasta (S$22), an addictive combination of perfectly al dente angel hair pasta tossed with truffle oil and konbu bits for bursts of umami. Truffle purists can say what they will about truffle oil being a second-rate imitation of the actual fungus — this dish had us clamouring for seconds. 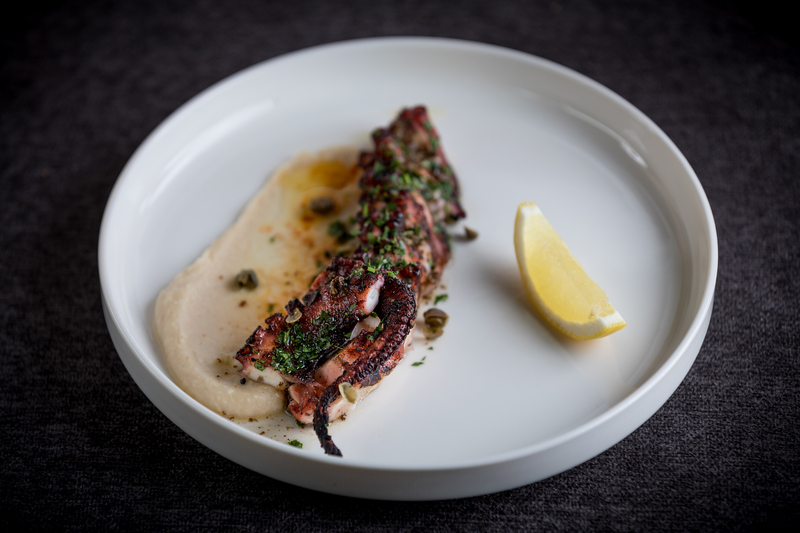 Served slightly charred, the grilled octopus with white bean purée was a satisfying concoction. Also noteworthy was the grilled octopus (S$27), which wasn’t overly chewy, and came slightly charred for a hint of smokiness. Capers and burnt butter added savoury flavours to the mix, while a smooth white bean purée contributed textural contrast. If you’re more inclined towards fish, don’t miss the Chilean seabass (S$36), which was once a signature offering on Restaurant Ember’s menu. The seabass was buttery smooth and with a firm bite, and was laden atop a scrumptious mushroom and bacon ragout we couldn’t get enough of. If that wasn’t decadent enough, the dish was also spiked with an aromatic truffle yuzu butter sauce. 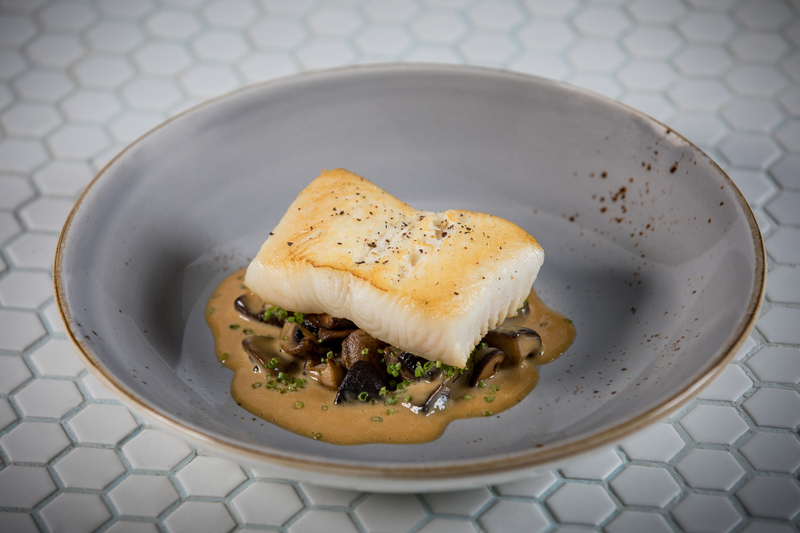 Silky smooth Chilean seabass set atop a mouthwatering mushroom and bacon ragout. For dessert, we had the restaurant’s pear tart (S$14), a crumbly pastry stuffed with chopped up pear and accompanied by a scoop of Bailey’s ice cream. It wasn’t the most cutting edge confection, but tasted of homemade goodness. If chocolate’s more your thing, Venue by Sebastian also serves a mean chocolate fondant with vanilla ice cream. The lava cake is crisp on the outside and, when cut open, gives way to a sinfully delicious molten chocolate centre. Talk about comfort food. The food at Venue by Sebastian is presented simply, bereft of elaborate plating, and is unassuming — almost ordinary — at first glance. But don’t be fooled by its lack of avant-garde creations. The cooking is down-to-earth and unpretentious, and every dish is well-thought-out and executed. The restaurant also has a pleasant, convivial atmosphere, making it ideal for big gatherings with family and friends. And it helps that Ng is easygoing and friendly. During our visit, we noticed him making his rounds to chat with customers and get their feedback on the food. It’s no surprise, then, that many of his old friends and loyal customers from his Restaurant Ember days, have been turning up to support his new venture. We spotted groups of them dining there — some even brought their own bottles of wine. Evidently, Venue by Sebastian isn’t a place for a fancy, fine dining meal replete with starched tablecloths and tuxedoed waiters. But if a hearty, honest-to-goodness meal in a casual setting is more your style, here’s where you need to be.